The Bengals are not expected to bring back longtime defensive end Michael Johnson, the Cincinnati Enquirer’s Paul Dehner Jr. writes. 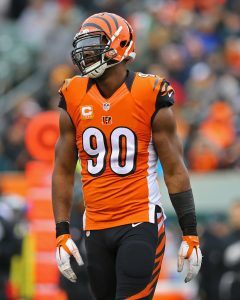 Before the start of the 2018 season, the Bengals released the veteran defensive end only to bring him back on a one-year contract the next day. Johnson filled a big role on the Cincinnati defensive line, soaking up 41 percent of the team’s defensive snaps and starting all 15 games he played in. With Carlos Dunlap, and the emergence of Sam Hubbard, Carl Lawson and Jordan Willis, Johnson was deemed as expendable. A third-round pick in 2009, Johnson began his career with the Bengals and developed into a solid starter in a five-year run with the team that included an 11.5-sack season in 2012. He moved to Tampa Bay following the 2013 season but spent just one season with the Buccaneers before returning to the Bengals. Since rejoining the team in 2015, Johnson has started 61 of a possible 64 games. In his 10th season, Johnson was graded as the No. 89 edge defender by Pro Football Focus, a middle-of-the-road mark. His veteran presence and proven production could make him an attractive piece for a team needing a complementary 4-3 defensive end. In 2018, Johnson registered 33 tackles and just a half-sack in 15 games. He did record an interception and his first career touchdown in Week 5 vs. the Dolphins. Class act! I wish him well!